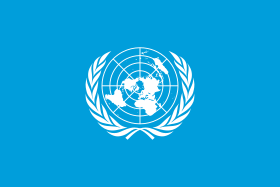 A white UN emblem (world map surrounded by two olive branches) on a light blue background. | Design = A white UN emblem (world map surrounded by two olive branches) on a light blue background. آخر تعديل لهذه الصفحة كان يوم 26 فبراير 2017، الساعة 15:20.